To be honest, if you’re planning a spring or fall wedding…or winter or summer, there is a HUGE chance of it raining on your big day! Our Fox Weddings team has filmed and photographed DOZENS of rainy weddings. It can lead to some issues if you’re ill-prepared, but if you follow these steps to prepare for the worst, this drizzle of rain may be the perfect piece of luck to bless your wedding day! If your plan is to simply cross your fingers and “go with it” you may find yourself in a pretty bad spot. Yes, the key to weddings is FLEXIBILITY, but you need to have a plan if the weather gods decide to rain on your parade. If it looks like there may be rain on your big day, and you’re planning an outside wedding, plan an inside reception that could act as a venue for your ceremony just in case. If you’re planning an inside wedding and an outdoor reception, make sure that you don’t completely set everything up for the outside until you know that those clouds are going to keep on moving right past your event. If rain is on its way, have the ushers (or whoever you’ve tricked into helping) wait on setting up the rows of chairs. No one wants to sit in a puddle of water. Another great option, if you absolutely know that rain will come and go before the wedding, is to already have the chairs set up and TARPED. This way, all the ushers have to do is remove the tarps before the ceremony. They risk splashing mud in the transfer and all they have to do is find a place to store the wet tarps! 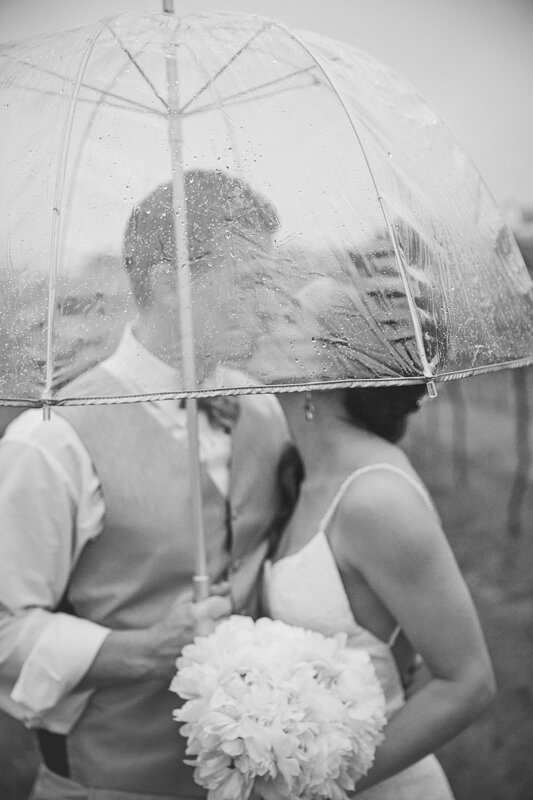 Here’s the thing: rain happens— especially if you’re planning a spring wedding. Why not plan for the worst and secure a tent ahead of time? Sometimes venues have tents on standby that you can add to the overall venue cost or you can rent one from an event rentals shop. The only thing is that with these tents, you really can’t set them up day of— it takes some time. So have one on standby and once you get a closer look at the forecast, you can make the ultimate call on to rent or not to rent! The safest option? Go tent either way! These white event tents are PERFECT for bouncing flash and letting your photographers get excellent light during weddings and receptions. So even if the rain gods hold off, you will have a lovely tent over you to block harsh sun rays and create a super festive atmosphere for your wedding. Listen to the Boy Scouts and Be Prepared! I have photographed a wedding where there was literally a river where the dance floor was supposed to be. My ballet flats were completely submerged and water was up to my ankles. Be prepared. Have some rain boots ready, bring some extra towels, and have several umbrellas at several locations! You never know, so plan for a storm! Here’s the thing: it’s YOUR wedding day and YOU get to decide how you want the vibe to be. If you’re chill, the rest of the wedding party will follow because everyone’s goal that day is your happiness. So, have the DJ turn up the tunes, pass around some drinks and hors d’oeuvres, know that all your family pictures will be perfectly lit under the tent, grab that clear umbrella, and go get your kissy wedding day portraits with the love of your life. I hope these tips help you make the most of the rainy weather! The best you can do is prepare for the worst, hope for the best, and love every minute of the outcome! You’re going to have the most beautiful wedding day because it’s all about you and yours and your love. In the end, that is all that matters! Happy wedding planning! Hopefully this post will help you weather the storm!